Every day, all across Delaware, people are thrown into crisis when they learn their spouse or parent must enter a nursing home or will require another form of major, long-term care. The shock of a stroke or other dramatic health setback to a loved one may quickly be followed by pressing concern about dealing with the expense. Nursing home care costs in Delaware range from between $8,000-$10,000 per month for a skilled nursing facility and slightly lower for assisted living facilities — a major drain on anyone’s resources. Medicaid is a primary resource in this situation, but where do you begin? What if you run into complications? Our lawyers know how to help in a crisis, and we encourage you to contact us for help. We help many husbands, wives and children of seniors in crisis obtain all available benefits quickly. Recognizing that you have other obligations to deal with, we not only advise you about Medicaid eligibility and other resources for support — we complete the Delaware Medicaid application for you. 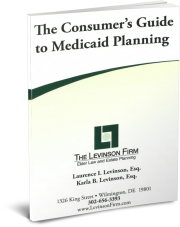 You benefit from our extensive knowledge of current Medicaid law, our thorough approach to providing the precise information the state requires, and you benefit by avoiding many of the costly mistakes commonly made by people in similar situations. Whether your loved one is already in a nursing home or you have just learned that will be necessary, please contact our proven Wilmington attorneys. We will help you in a crisis, provide pre-crisis planning that will benefit you later, or simply provide free informational materials to help you understand critical issues.